Take the Samsung Galaxy S5. 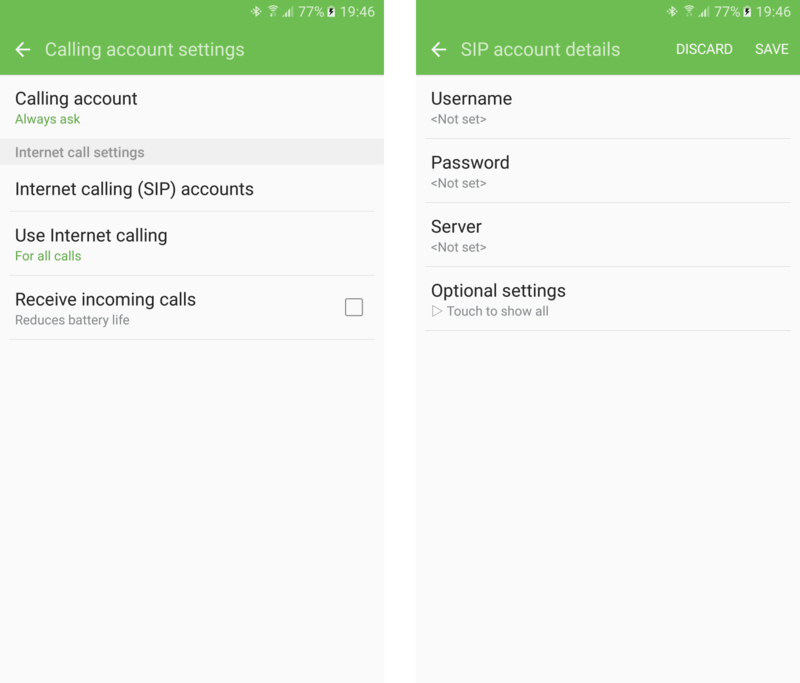 It runs Android 6.0.1 and the “Phone” app still has “Internet call – Calling account settings”. SIP calling works perfectly fine on the latest Samsung Galaxy S7, it only needs to be configured the same way in “hidden” settings. 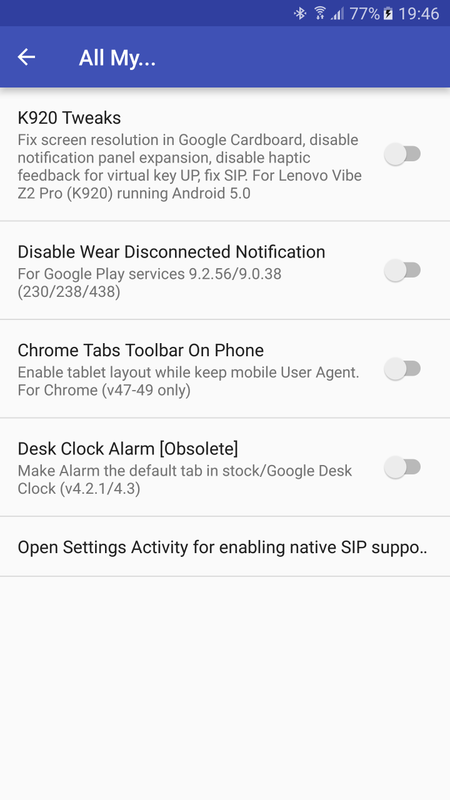 To view this settings screen, you need to start activity “com.android.phone.settings.PhoneAccountSettingsActivity” (or “com.android.phone.CallFeaturesSetting” on some other phones). You can do this in apps such as QuickShortcutMaker. Or just use my app All My that is primarily a Xposed module but it has a button dedicated to open this setting screen directly. Update 4/2017: With later Android 6.0 ROM updates, there was an issue with sound (logcat showed “W/AudioGroup: device loop timeout”) but it’s reported to be ok again with Android 7.0. Hi! i tried it, it work, but when i a make call with my voip.ms account, the sound always cut. Do i have to change some settings? Do you know any trick to attach a SIP number (address) entry to a contact on S6? On S4 I was able to dial directly via mobile network, but I could add another entry to any contact and to invoke call via VoIP account without need to select line (mobile/VoIP) each time. enabling sip on my mom’s DooGee through this workaround generates an error, something like “com.android.phone” process interrupted. Any clue? This particular feature (opening system configuration) doesn’t require root so you can just ignore the dialog – cancel it and go to Experiments section. it wont let me near experiments at all it just quits. Tap outside the dialog or hit back button and you will be able to use the app this way. Worked a charm with callcentric. Audio works fine too, I’ve test only with LTE/4G though. If I enter the details in SIP settings on my Note 8… i get how to receive calls, how do I make internet calls from the native phone app? What do I need to do? Or will I need a 3rd party to make the call and if so, this defeats the purpose of entering SIP settings in the native app, doesnt it? Sorry, I don’t have time to answer all those questions and this is for people who already used VoIP in some form in the past in another Android. If you don’t know the simple basics then you are better off not using VoIP in your phone in the first place. I guess he meant how to choose the sip account when placing a call. Into the note 8 when in address book or telephone app you are showed two icons to tap with sim1 and sim2 so that you can tap away with the sim card you want to use but what if you want to use the sip account? If you use Google assistant then a panel arises with both sim card and the sip account one so you can choose but how to do it within the telephone or address book native app? Thank you. I downloaded QuickShortcutMaker and chose the 3rd Phone app in the list, and scrolled until I found com.android.phone/com.android.services.telephony.sip.SipSettings and I was able to add my SIP provider there. Yay! Wi-Fi calling!